It is hard but not impossible to succeed at content marketing without creating blog posts on a regular basis. I am very happy you’re here! Writing good content is very important while blogging. Every successful blog is built on a solid foundation of content. In this post, we discuss writing great content for your own blog post. We talked about everything from how to get content ideas to how to make your content interesting. Content is the pillar of every blog and if you write good content, it’ll be easier for you to build an audience. I am sure, the writing an attractive blog post that drives traffic and leads is no easy task. Blogging is an inbound marketing strategy that truly works. No matter what industry you’re in, you can set up a WordPress blog and start creating high-quality content. But, to rank well in Google and drive leads to your business, you need more. 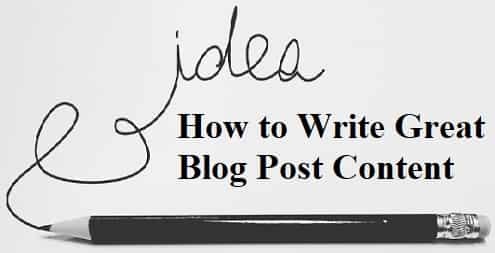 It is the most important thing how do you get to blog post content idea. According to my own experience, you will get blog post content idea from Forum questions/discussions, User comments. Also, you can get post topic from Quora, Buzzsumo, and StackOverflow. Most important thing how much time you give to write one article. According to me always start writing the post when you have not near future disturbance because once you start writing post always focus on it and do not any task during writing article. You must give a minimum 2-3 hours to write one meaningful article because the first 1 hour will be for analysis and next 2 hour for writing. A well researched and in-depth article that answers the question is quality content in my opinion. Your content that is to the point and helpful for readers plus interesting, inspiring and motivational readers to take the action. Solving one specific problem of readers. Motivating them to take action on the solution. You must provide both Quality & Value. Well-defined writing style on topics I know a lot about, personal anecdotes, examples, and well-selected graphics will make more interesting of your blog post. Always take one example to explain any subtopic (Ex: If you use this tool what happens, if not what happens). Here refer mean see the title, main topic, the subtopic of the post and do not copy from another blog. When you refer other blogger blog post then you will get more idea how to create the title of the post? how to manage content? how to add subtopic? and many more. When researching keywords, look over the user’s shoulder and see things from their perspective. That’s the quickest way to create blog posts that are relevant and timely. An important step in on-page search engine optimization, keyword research tells you what your target audience is searching.